2 Bedroom End of Terrace House For Sale in St. Ives for Asking Price £199,000. This cute two bedroom end of terrace house is centrally heated and has a good sized kitchen and a light and airy lounge with access to a level garden. There are views to the sea. Upstairs are two bedrooms and a family bathroom. The property is in excellent order and is well maintained. 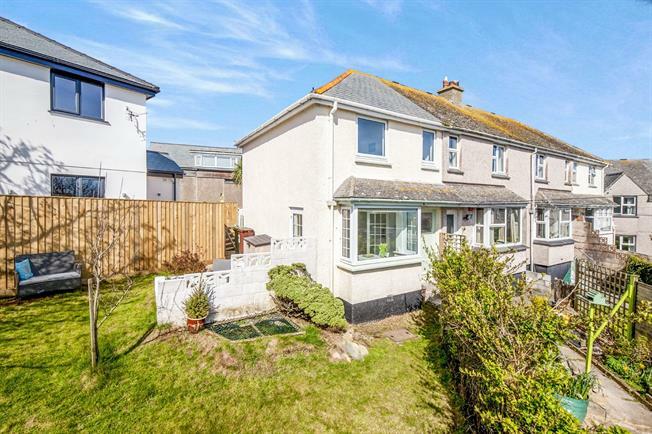 Two double glazed windows to the rear enjoying fine sea and coastal views to Godrevy lighthouse, fitted carpet, heating radiator, picture rail, fitted wardrobe. Double glazed window to the front, fitted carpet, part panelled walls, heating radiator, wardrobe and shelving, picture rail. Fitted with a white suite comprising of a panel enclosed bath with mixer taps and shower attachment, pedestal wash hand basin, low level w/c with push button flush, vinyl flooring, heating radiator, tiled walls, obscure double glazed window to the front. To the front of the property there are attractive courtyard style gardens with a mature palm tree, gated side access leads to a rear patio area and southerly facing gardens with are laid mainly to lawn with palm and mature tree enclosed by fencing.